the watch designed for your life. Tackle even the toughest workouts with a design that&apos;s durable and sweatproof to withstand any element. Optimise comfort, security and sound by customising Flyer with interchangeable ear tips, wings and fins in different sizes. Water-resistant design uses hydrophobic nano coating to keep Flyer rain, splash and sweatproof. Get sound that&apos;s precision engineered for crisp audio, powerful bass and dynamic range enhanced by WavesMaxx audio. Enjoy up to six hours playtime on a full charge. Plus get an extra hour of playtime fast with a 15-minute quick charge. Simultaneously connect to two devices at once – smartphones, computers and more – using Bluetooth 4.2. Adjust sound, pause or change songs and answer or end calls with the streamlined 3-button control box. Get high-quality, hands-free calls in any environment with a dual microphone that suppresses external noise like wind. Use the Signature sound setting or amplify bass with Power Boost enhanced by WavesMaxx Audio. 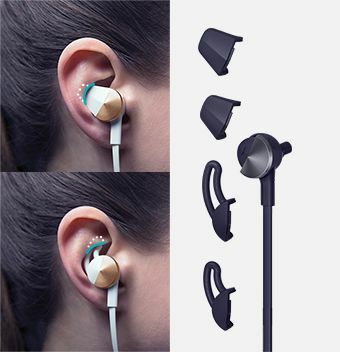 The adjustable cable ensures that headphones stay comfortable and secure throughout the day and during high-intensity workouts. Seamlessly connect to Fitbit Ionic for hands-free, phone-free music and more. Find your fit. Love your sound. Mix and match the ear tips, wings and fins on Fitbit Flyer for a custom fit that optimises your comfort, sound and security. 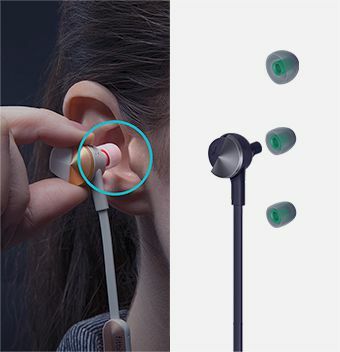 For the best sound quality, choose an ear tip size that seals the ear and blocks sound. For security all day and during exercise, pick a wing or fin size that tucks comfortably and snugly into your ear. Flyer is designed to be rain, sweat and splashproof. Some condensation will not damage the headphones, but avoid splashing large amounts of water on them. They should not be submerged.